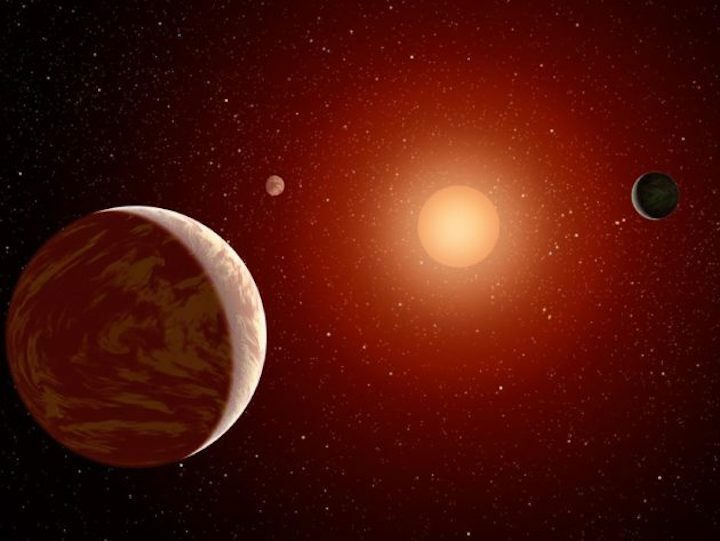 Where’s the nearest exoplanet with conditions that are right for life? Over the past couple of years, astrobiologists have talked up Proxima Centauri b, which is sitting just 4.2 light-years away. But Villanova University astrophysicist Edward Guinan favors a world that’s just a bit farther out, at least in astronomical terms. It’s Barnard’s Star b, a super-Earth that orbits Barnard’s Star, 6 light-years from our solar system. Both planets have red dwarfs as their parent stars, but their environments could hardly be more different. Proxima b is thought to bask in an Earthlike range of temperatures, but it’s also bathed in 650 times more X-rays and 130 times more ultraviolet radiation than Earth experiences, Guinan said today during a news briefing at the American Astronomical Society’s winter meeting in Seattle. Because of its wider orbit, Barnard b gets only 2 percent as much illumination as Earth does. Its surface temperature is thought to be somewhere in the neighborhood of 270 degrees below zero Fahrenheit (-170 degrees Celsius). But on the bright side, it gets half as much X-ray exposure as Earth does, and 35 percent as much UV radiation. “You can avoid those high radiation levels — if you don’t mind the cold,” Guinan said. The key question about Barnard b has to do with exactly what kind of planet it is. Based on 18 years’ worth of archived spectral data, Guinan and his colleagues estimate that the exoplanet is at least 3.2 times as massive as Earth, in a middle range between our own planet and Neptune. The mass could be significantly greater, depending on how Barnard b’s orbit is oriented with respect to Earth. If Barnard b is a rocky super-Earth with an icy shell, there’s a chance that life could exist beneath the ice. If Barnard b is a massive, gassy mini-Neptune, the chances for life decrease dramatically. Guinan and his colleagues hope the planet is on the smaller side of the size spectrum. And he said the planet is “on the hairy edge of being imageable” with instruments like the SPHERE adaptive-optics system on the European Southern Observatory’s Very Large Telescope. “If they see it, it is probably not good,” Guinan said. That would suggest Barnard b is on the bigger side of the size spectrum, and more like Neptune than like Earth. The outlook for directly imaging Barnard b would be better when next-generation space observatories like NASA’s James Webb Space Telescope, WFIRST telescope and the proposed planet-hunting LUVOIR telescope swing into operation, over the next decade or two. Even future ground-based telescopes, such as the Thirty Meter Telescope that’s planned for construction on Hawaii, could spot Barnard b if they’re equipped with the right kind of adaptive optics. An Earth-sized planet that’s orbiting in the habitable zone around Barnard’s Star “is one of the easiest targets for TMT,” said Thayne Currie, who works on the Subaru Coronagraphic Extreme Adaptive Optics system that’s attached to the Subaru Telescope in Hawaii. Spectral analysis of the light reflected by the planet could tell astronomers whether it’s a super-Earth or a mini-Neptune. But even if it’s habitable, we’re not likely to build ice hotels on Barnard b anytime soon. Even if you could travel at the velocity of the fastest-ever spacecraft, it’d take about 17,500 years to get there. Check out the poster presentation for “X-Ray, UV, Optical Irradiances and Age of Barnard’s Star’s New Super Earth Planet – ‘Can Life Find a Way’ on such a Cold Planet?”The authors are Guinan, Villanova astrophysicist Scott Engle and Ignasi Ribas, director of the Institute of Space Studies of Catalonia and the Institute of Space Sciences.